Handmade in the USA by Kevin Arthur. 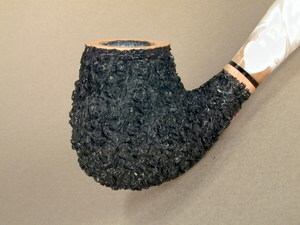 Coral finish bent apple shape. Full bent. Military stem with Arctic swirl Lucite. Cloth pipe sleeve included. L = 5.5 in. /14.2 cm. H = 2.2 in. / 5.6 cm. Depth = 1.7 in. / 4.2 cm. Weight = 2.2 oz. / 61g.